The Gateway Florist has been a part of Annapolis since 1979, originally located in the historic district at the "Gateway" entering the city of Annapolis. In the summer of 1999 we relocated to our current home in the Geaorgetown Plaza at 914 Bay Ridge Road. The Gateway Florist has continously provided Annapolis and the capital area with the most creative ideas and unique gifts making us much more than your typical florist. Whether ordering on line, by telephone, or in person, let one of our staff members help you make ordering your flowers and gifts easy and effective. We pride our self in customer service because you are the reason we are here. Come join The Gateway Florist family, because "Flowers are the Gateway to the Heart". 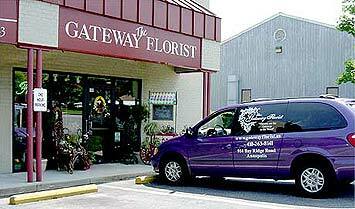 *The Gateway Florist is open from 9:00am to 5:00pm, Monday through Friday and from 9:00am to 2:00pm on Saturday. We are closed Sunday. To help assure on time delivery during the busy holiday season, place your order a day prior to the following major holidays: New Year’s Day, Valentine’s Day, Easter, Administrative Professionals Week, Mother’s Day, Memorial Day, Father’s Day, Independence Day, Labor Day, Thanksgiving Day, and Christmas Day. Our shop will be closed on the following major holidays: New Year’s Day, Mother’s Day, Memorial Day, Father’s Day, Independence Day, Labor Day, Thanksgiving Day and Christmas Day. The Gateway Florist in Annapolis, MD provides floral design delivery services to the following areas and zip codes in Maryland: Annapolis, Arnold, Cape St. Claire, Crownsville, Davidsonville, Edgewater, Glen Burnie, Millersville, Riva and Severna Park. 21401, 21402, 21403, 21404, 21405, 21409, 21411, 21012, 21140, and portions of 21037. Annapolis Life Care Inc Annapolis Nursing & Rehab. Weekly arrangements to area businesses. If you have any questions or need more information, please call us directly at (410)263-8141 or (800)284-6488. Or you can fill out our Contact form. We're always here to serve you and make your flower-sending experience a pleasure. U.S. orders must be received before 12:00pm in the recipient''s time zone to assure same day delivery. Orders received after that time will be delivered the following day. A wire service fee of $8.95 will be added to each order. We do our best to accommodate deliveries at specific times of day, but we cannot guarantee due to unforseen circumstances. Any international orders must be placed directly with the shop. We are unable to accept international orders over the Internet.